When water damage takes over a residential or commercial property, it can cause some serious issues. One of the main concerns of water damage is the potential of a fungal infestation. These infestations can begin growing in a property after being exposed to water for as little as 24 hours. Most of the time, water damage isn’t realized for days. Therefore, if you find yourself in need of water damage restoration services, there’s a chance you will need mold removal too. Either way, when your property needs a fresh start, call the team at 911 Restoration of Memphis Metro. Our Memphis mold removal experts have the knowledge, experience, training and equipment needed to handle any water damage situation thrown their way. The safety of those on the property is our team’s number one concern. 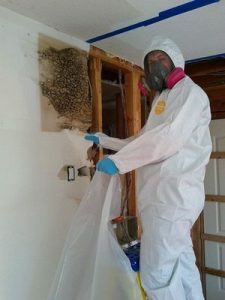 Therefore, we will take every necessary step to guarantee that complete mold remediation has occurred and provide any other restoration services that are deemed necessary. 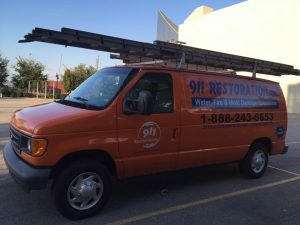 Whether you need help recovering from a fungal infestation, plumbing problem, leakage or any other water damage issue, call the Memphis experts at 911 Restoration of Memphis Metro. We will restore your property and peace of mind. What Causes Fungal Infestations and the Need for Mold Removal? Before mold can begin growing in a residential or commercial property, it needs to be exposed to the following: a food source (drywall, wood), mold spores, darkness, warmth, oxygen, moisture (water leaks, humidity) and time. However, moisture is the key cause behind mold growth. So, if your property is in need of mold remediation, it is highly likely that you have a moisture problem. The Memphis area can experience humid weather for days on end, especially when it seems like the rain hasn’t stopped in weeks. When this occurs, it is common for mold infestations to begin growing on walls and other surfaces due to the moist air. Another cause for mold removal can be a leaking pipe. Without receiving proper water damage restoration following a leak, mold growth can begin to take place. Despite the cause behind the infestation, it is important to seek mold remediation by contacting 911 Restoration of Memphis Metro. Damaged paint or wallpaper. Mold colonies tend to grow inside wall cavities due to its favorable elements. Once the infestation occurs on the paneling, it will cause the materials to decay and start to separate. This is a clear sign that you are definitely in need of mold remediation. Damaged floors. Mold infestations are able to breed easily under flooring. When these infestations occur it can cause discolored carpets and hardwood floors to lift. If you believe your floors have fallen victim to mold, call our mold removal experts. Stained ceilings. Many infestations tend to happein the attic or between floors. When this occurs, it can leave behind ceiling stains as evidence. Usually, when a ceiling is stained, mold is more than likely the cause behind it. If this is the case for your home or business, our water damage restoration team can get you back to a fresh start! Smelly odor. If you opened your closet or another enclosed area and experienced a very distinct, stagnant water smell, you more than likely have the need for mold removal. Luckily, smell is an early sign of mold infestations. So, as soon as you smell it, call our mold remediation team! If you spend a lot of time in a residential or commercial property that has a mold infestation, you may begin to experience respiratory effects, headaches or other symptoms. Black mold, in particular, is often invisible and can grow inside a property undetected for years. It increases the risk of health issues like asthma, allergies, and has even been linked to depression. 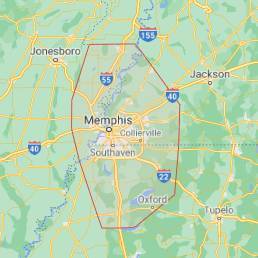 Because of the health issues these infestations can cause, it is important to call the mold removal team at 911 Restoration of Memphis Metro as soon as you suspect an issue. Your health and the health of those who inhabit the property is the water damage restoration team’s top priority. Our team will find the source behind the mold, determine the extent of the infestation and then provide efficient mold removal services. We understand that damaging effects needing water damage restoration can have on you mentally. Our team will work with you every step of the process. When you have questions about mold remediation we will answer them. If you have concerns about other water damage, you can guarantee we will ease your worries. Call the mold removal team in Memphis to get on the path to a fresh start and get your property back to pre-damage condition today!